Given that the holiday is nearly upon us now, it seemed like a good time to play a game called “Santa’s Workshop” where players try to earn the most Christmas cookies by taking care of the reindeer and constructing as many gifts as they can for those deserving children. Each player is in control of a team of elves as well as a starting supply of coal. Each player also receives three gift cards – which represent letters to Santa in which children ask for certain toys. Of course, being the smart kids that they are, they also helpfully include a list of colored cubes needed to make said toy as well as a chart outlining the possible scoring rewards for making such an in-demand toy. Players must keep at least one of the three cards dealt to them. The rest are placed under the gift card deck. Six more gift cards are dealt face up to the mailroom section of the board. 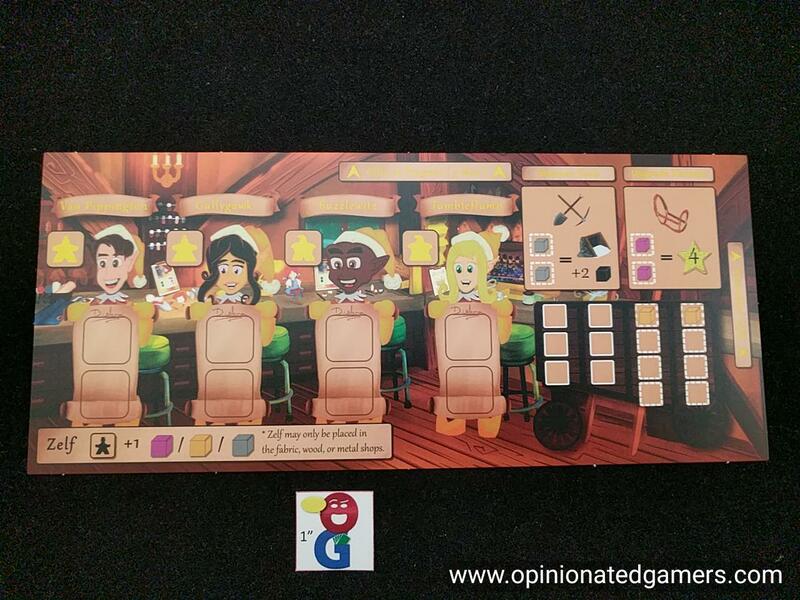 The players also each get a player mat which shows their personal area in the Workshop. There is room for unfinished toys above the mat. There is also a coal cart, mining tools and reindeer harness areas. Each of these can be finished or supplemented with a different type of material. The majority of the area is for your elves. Each elf has two diploma spaces – over the course of the game, the elves can go to the Classroom to learn advanced gift making techniques which will give them bonuses later in the game. Tokens denoting those bonuses will go underneath the elves here. The game is played over nine days – each day having the same three phases. Progress through the game is kept on a string of calendar pages – the game starts on December 16 and ends at the conclusion of December 24 – after all, at that point, there’s no more time to make toys in the workshop! At the start of each day, there is a little bit of upkeep. First, all the reindeer stalls get a cookie added to their current contents. Then, the classroom is filled up so that there is one learning token of the four types (fabric, wood, metal, assembly). 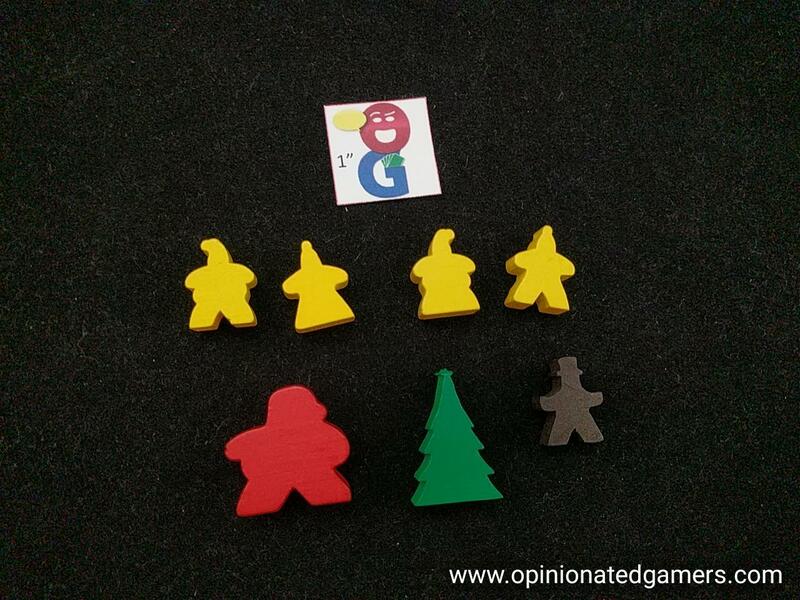 Then, starting with the starting player and going clockwise, each player will place one of his available elves on a free action space and then take the action of that space. Then, the next player gets to place on of his elves. This continues until all elves have taken an action. 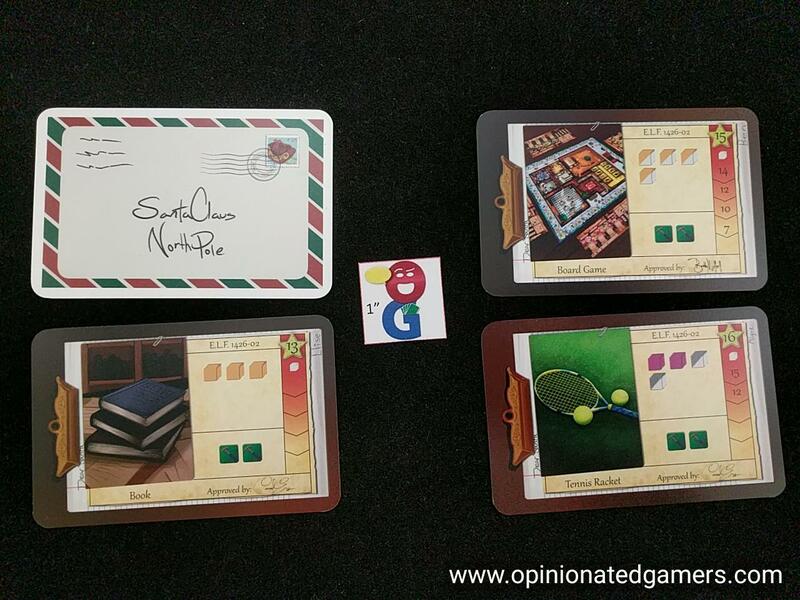 Mailroom – here is where you get new Gift cards; the left action space allows you to choose any 3 cards, the right space forces you to discard all the existing cards, deal out a new set of 6, and then draw 2. Either way, you can always choose to take a mystery card from the top of the deck instead of a face up card. You are limited to having only 5 unassembled gifts. You are not allowed to draw any more cards if you already have 5 above your mat. Fabric / Wood / Metal shops – these rooms are where you get your good materials from. There are two sorts of spaces here… One coal for two of the chosen resource OR three coal for three of the chosen resource. When you collect these resources, you must place them immediately on unfinished gifts OR on upgrades on your player boards. Any resources unable to be used are lost. Plastic Lab – Take the action here to take up to 7 plastic cubes. Many of the gifts can use either the “real” resources OR plastic. You can fill in the either/or spaces as you like. Be warned! The kids know that toys made with plastic are not as awesome, and the VP value of a gift goes down with each plastic cube used. Assembly Hall – One you have brought all of the components together for a gift, you still need to put it all together! Each gift card has an Assembly token requirement – all of these spaces need to be filled in with tokens for the toy to be complete. There are spaces here for 1 or 2 Assembly tokens. Like resources, they must immediately be put into play, and any excess are lost. 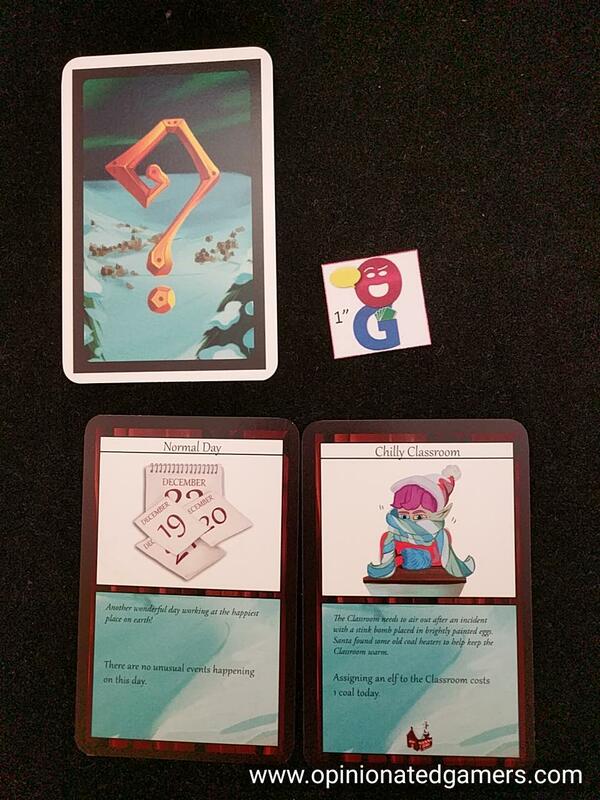 If a gift card has all of its assembly tokens on it, you immediately score the value of the gift, and then you place it face down to the right of your player mat. Coal mine – this is the one space on the board without a placement limit. Each elf placed here gets four coal for his player board. As you would expect, any in excess of your storage limit are lost. Reindeer Stable – there are 8 different stables here (no Rudolph) – at the beginning of each round, each stable gets a cookie token placed on it. If you choose one of the stables, you put your marker on the chosen stable, and you take all the cookie tokens (And score points for them). Then, each reindeer gives you a single action as a bonus (take on Assembly token, take on gift card, take one resource, etc.) Donner has a special action, there is a Zelf token here. When you put your elf here, take the Zelf. You can place the Zelf on any later turn in the round; he must go into the Fabric/Wood/Metal spaces; and when he is placed, he generates an extra resource of the chosen type. After the actions are complete, all of the elves are returned to the player mats. The Zelf goes back to the Reindeer stable. If you are at a break in the calendar track (end of Day 3, 6, and 9) – there is an inspection by Santa Claus, and bonus cookies can be awarded at these three occasions. The players count their completed gifts for this stage of the game. The player with the most scores 2 cookies per completed gift, the second most gets 1 cookie per gift. All players now discard all their completed gifts at this time. The next bonus only takes into account gifts completed since the last inspection… Then, the round marker is advanced to the next day. If you’re at the end of the track, then move into the final scoring phase! There is a small scoring at the end of the game for unfinished things. For each fabric/wood/metal and assembly token on uncompleted gifts, you score one point per thing. Note, there are no points scored for plastic. You also score one point per two coal pieces left over. Ties go to the player who had turned in the most coal at the end of the game, then to the player with the most training tokens. 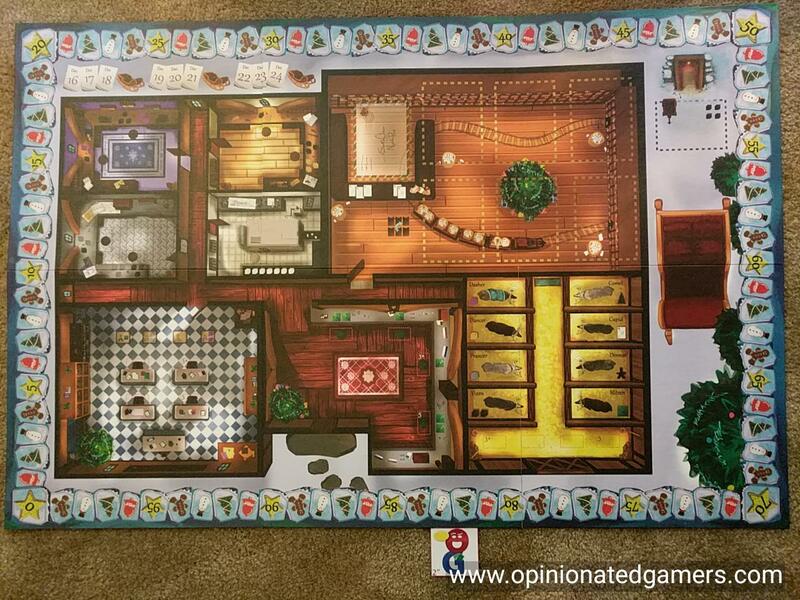 Well, Santa’s Workshop certainly has temporal appeal – it was definitely a good choice for winter-time gaming to get everyone in the holiday mood. It’s a nice entry-level worker placement game. There aren’t too many different options to have to remember/consider. In addition, all of the actions have helpful icon reminders of the actions next to the spaces. This is nice because the theme appeals to younger gamers for sure, and this turns out to be a worker placement game that can be used as a starter. (Yes, I know that the box says 14+ for the age limit, but I am thinking this is more for legal purposes because of the small, possibly eaten pieces). In our first few plays, the strategy has seemed straightforward. The main way to score points is by completing gift cards – and the big choice, such that it is, is whether or not to go for complex gifts which have a high payout versus multiple smaller cards with compensation through the Inspection bonuses. You can also try to increase your card output by using plastic instead of regular resources. But, this isn’t the sort of game where there are multiple paths to victory – thought it’s not completely one tracked. You have to be the most efficient at completing the gifts. I’ll admit that I’m not sure that I’ve figured that balance out yet though. I think that your choices here will be driven mostly by the needs on your cards at any particular time… i.e is it better to spend one coal for 2 resources OR three for three? 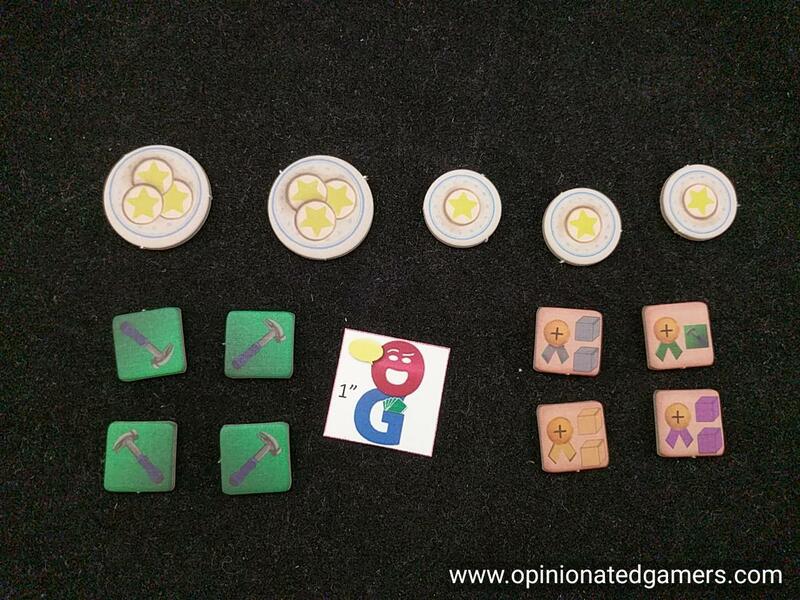 Or should you take training tiles early in the game and then reap the rewards of the extra goods/assembly tiles? I like the reindeer action spaces. First, they do give another way to earn victory points, though the amounts offered here feel more like a tie-breaking amount rather than a path to victory (there are only 72 cookies total offered here all game, there are some single gifts that are worth 40+ points). However, they also do give players another chance to take a particular type of action – which makes the game a bit more forgiving as well. And, given the way that you can’t save any actions, sometimes it might be a better choice to take a single resource of the type you need and at least get a few cookies to boot. The artwork / graphic design is simple and unobtrusive. The different rooms in the workshop help to distinguish the different possible actions. The gift cards make it clear what is needed to complete the gift and how much it will score. The game’s not going to win any awards for design, but thankfully, unlike some of the other Rio Grande games in recent memory, the graphics aren’t going to hinder you from playing. 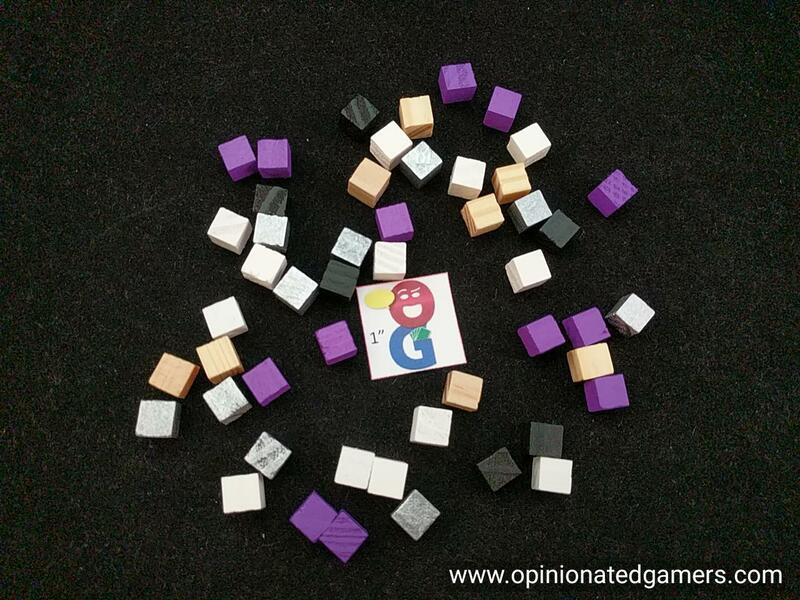 The game scales nicely based on player count as there are cover tiles that are used to keep the number of actions available proportional to the player count. So, the tension of choosing an action feels the same regardless of the number of players. 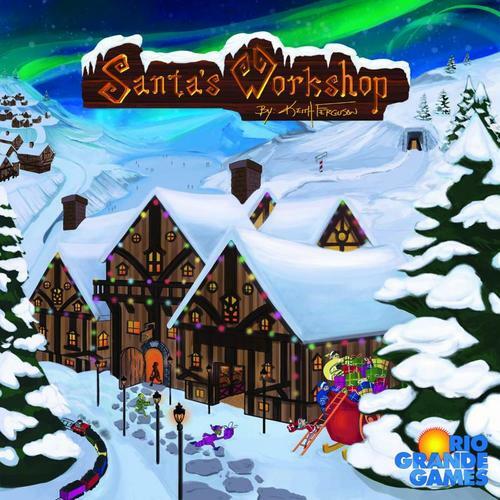 Thus far, Santa’s Workshop has been an enjoyable game, and it has made it to the table a few times this month because of the appropriate theme for the time of year. The bigger question for me is whether or not this is the kind of game that will get played in June when we’re not having holiday themed gaming. For now, that question is moot. So, we’re going to have a bit more egg nog and get this one played a few more times before we pack up the Christmas tree.